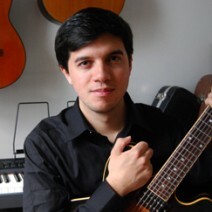 Guitarist Alejandro Florez earned a Master’s degree in Jazz Performance and Composition from the University of North Texas before moving to NYC. He now performs in various jazz and Colombian bands, and works as a composer/arranger, session player and educator. Alejandro’s current projects include “Tibagui,” which performs his original music; the Alejandro Florez Trio, with which he performs original jazz; the free improvisation trios “Apama” and “Torus,” and the quartet “Trichrome Roach;” and the Gallo/Florez Duo, a group that explores the traditional music of the Colombian Andes in an improvisational end experimental setting. The album Retrato, featuring his band Tibagui, is his first record as producer and composer. The Latin American edition of Rolling Stone Magazine called the album “flawless from start to finish” and “indispensable.” Alejandro’s song “Cansao,” featured on the album, was selected as a Finalist at the 2008 John Lennon Songwriting Contest. For more about Alejandro, visit www.AlejandroFlorez.com.